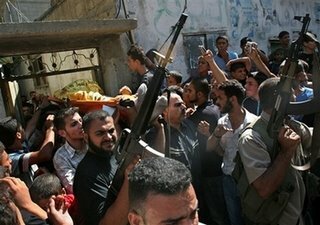 The situation in the Palestinian Territories is very tense after 12 were killed in the worst factional violence in months. The current wave of violence which began on Sunday has killed 12 people and injured more than 100 most casualties occuring in clashes between Palestinian president Mahmoud Abbas’s Fatah faction and Hamas in the Gaza Strip and the occupied West Bank. The Al-Aqsa Martyrs Brigades, an armed group linked with Fatah, said it held Hamas’s Damascus-based political chief Khaled Meshaal, Palestinian Authority Interior Minister Saeed Seyam and senior Interior Ministry official Youssef al-Zahar responsible for the deaths. “We in al-Aqsa announce, with all might and frankness, the ruling of the people in the homeland and in the diaspora, to execute the head of the sedition, Khaled Meshaal, Saeed Seyam and Youssef al-Zahar, and we will execute this ruling so those filthy people can be made an example,” a statement said. Also on Tuesday, gunmen allied with Fatah forced the closure of several schools throughout central Gaza, ordering children and teachers to leave. Fatah gunmen also blocked a major intersection in central Gaza on Tuesday, shouting “Down, down with Hamas,” burning tires and garbage dumpsters and shooting in the air.